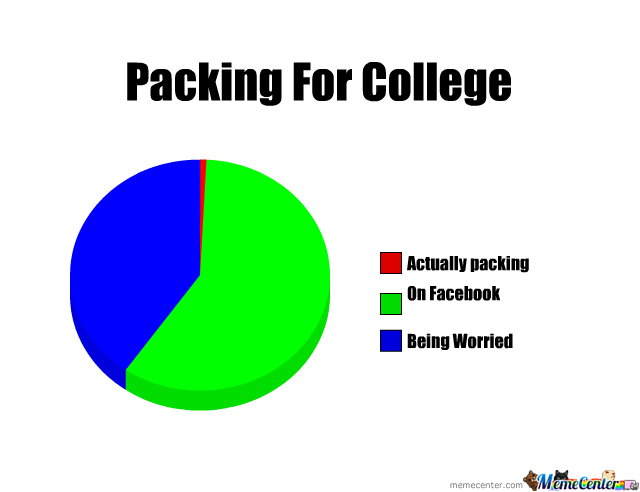 Overpacking for college is a critical mistake dozens of Freshmen make every year. It can be difficult to judge how your college dorm room may be; especially if it’s an entirely new environment. I’m going to trust you that you already have an essential list to bring (chargers, school supplies, bedding). My goal here is to point out some tips that may not seem so obvious to your average Freshman. To start off, let’s talk about clothing. Keep in mind, I go to school at New York University. The intensity of the Winter’s here as well as the fact that I’m a SoCal kid = I brought a LOT of Winter gear. You won’t need all of your winter jackets until at least Thanksgiving. Remember that if you visit home alot, you’ll be able to switch out your warm weather gear with layers. There are only a couple of thing I would reccomend OVERPACKING for. Pack as many socks, and underwear as you want. You’re going to put off laundry some days, and it’ll be annoying to always do laundry just for these things. Bring one set of really nice clothes if you were to have a professional job interview for. Suit, tie, dress shoes, the whole works. This’ll save you time from begging your friends for these things if you forget. Bring a comfortable pair of sweat pants or gym shorts for days when you feel like staying in. Don’t bring a lot of clothes from your High School. You’ll find out that you’ll get plenty of clothes at your new college showing off your school. Two pairs of swimming shorts will be enough. Bring a tall laundry hamper rather than a wide one to save room space. If you have to debate about bringing a certain shirt or pants, chances are, you won’t be bothered if its not with you in college. Remember, you can always pick up the clothes you really want if you visit home during break. Your bed at your college won’t be comfortable and they’ll give you maybe only one pillow. Buy extra pillows and bring clean sheets/covers to treat yo ‘self. Bring those small sentimental things that you know will make you feel better for times when you feel homesick. Even if it means bringing you entire album collection of your dog. Who cares what other people think. If your college dorm has a communal bathroom you’re required by law to bring shower shoes. Not really, but seriously these shower dorms are gross. Bring a shower caddy with: shampoo, shower gel, face wash, toothbrush, floss, toothpaste etc. It’ll make your life a whole lot easier. Always bring a lot of extra towels to dry off. When you start to slack off with laundry, this’ll be hero. 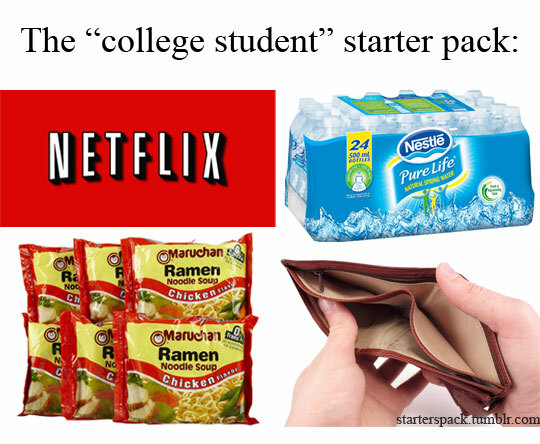 ALSO, buy large containers of shampoo and soap to last you the entire semester. Buy 2 or 3 deoderants and hair gel to save you the trip for when these things run out. Remember to bring cheap plastic cups, plates, and bowls. Get in the habit of washing your dishes immediately after you eat. You won’t look like a jerk roommate. Contact your future roommmate(s) to sort out who’ll bring the fridge and the microwave. This’ll save a lot of time and unnecessary stress. Bring tupperwares to snag some food from the college dining hall. It’s tempting to spend a lot of money on all kinds of different organization supplies. The “trendy” dividers you end up buying might not be used at all throughout the year. Buy a cheap whiteboard or planner to set plans and write out your to-do lists. Personally, I just use the notes tab on my iPhone to write down all of my priorities. Don’t bring a bunch of different picture frames because this’ll take up too much space. Create a small photojournal instead to keep on your shelf. If you must, I only recomend bringing one or two frames. College dorm rooms are disgusting. Buy a rug, and thank me later. Oxiclean, lysol wipes, and air freshners are hero. You might find that it’s difficult to find time to clean when you’re busy with school work. When this happens, you’ll need these three things to prevent your dorm from becoming a pig sty. You need paper towels. A lot of them. The same applies for trash bags as well. Power strips will make your life easier to charge phones and laptops. It could be convinient to have your very own printer to use, especially if the university printer is located all the way on the other side of campus. The lighting in your college dorm may be weak. I always bring a different large lamp to use to make it easier to concentrate on my work. Plus, this’ll help make your college dorm room look less depressing.